"That's right! I haven't seen them in months! Aren't they gorgeous!! We knew we invited The Jive Aces to The Rhythm Club for a reason! We just didn't know what it was back then. Now we know -- TO WELCOME HOME AUGIE! 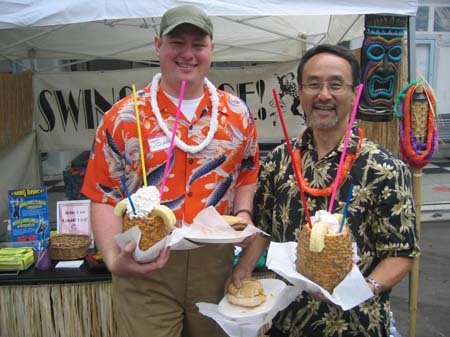 Yes, the day we've been waiting for finally came to being, when Augie appeared before our very eyes on Saturday at the Richmond Street Fair. We also now know the literal definition of "grinning ear to ear"! Augie and his Marine pal, Adam, smiled the brightest smiles I think I've ever seen all afternoon. There's so much to tell about Augie's safe return, and you'll all have a chance personally to welcome him home THIS Wednesday for his very own home-coming dance at The Rhythm Club. The Jive Aces are in on it, and can't wait to meet Augie in person and play a specially hand-picked song for his welcome home dance. I've had a chance to put up pictures from the street fair. Take a look and see Augie dancing up a storm on the homefront. Thanks to Stanley Sheff (who helped me via the Marconi all afternoon) I have been able to work on the scrapbooks again. We are still struggling with the colors of the pages, so excuse the work in progress, but enjoy the pictures! 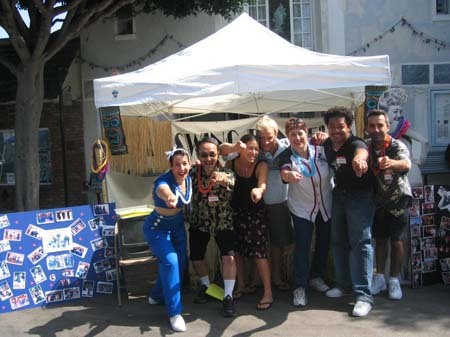 We sure had fun last Saturday at El Segundo's annual Richmond Street Fair. Loads of people stopped by our fabulously decorated booth -- special extra thanks to John Kanaster for showing up at 8:30am to make our booth really stand out with his super-duper Hawaiian 1940s themed decorations. We danced around the booth all day. And there was always a small crowd gathered around to enjoy the music, the dancing, and the smiles. Special thanks to all the volunteers of the day (and I hope I haven't left anyone out): Jeremy, Catheryn, Norman, Maile, Dante, Fons, Will, Augie, Jon, Priscilla, Kenn, and to Jeremy's entire family for cheering us all on during the show (about twenty people!!!!). The Swing Shift Fliers were on hand to perform two routines: "Sing's Charleston" and "Three Cool Cats." Thanks to Ken, Ted, Jeremy, Sarah, and honorary Flier Priscilla for their enthusiastic dancing! You just got love the Jives! These guys are "old school" personified. They (like one of your friends, Miss Rusty Frank) practically live in the past of the 1930s and 1940s -- certainly in their imaginations and performing spirit. When they're on stage, they bring alive the best of that entertaining magic of the great swing era. They ENTERTAIN! Each time we are lucky enough to getting a booking with them, I count my lucky stars. They're are just the best of the best. Get ready for an evening of dancing "frenzy"! We'll really crank up the air conditioning that nite! 8:00-11:30pm -- Dance! Dance! Dance! The Fabulous Esquires Swing Band at "Dance Downtown!" outdoors on the Music Center Plaza, featuring swing and salsa dancing to live music. dance lesson at 6:30 pm and live music from 7:15 pm to 10 pm. Admission is FREE. Put on your dancing shoes and don't miss this chance to dance under the stars on some of the loveliest nights of the year. Come downtown and dance at the Music Center! If you are a tap enthusiast, there are two new dvds available from Rusty Frank and her On Tap business: "Leonard Reed's Shim Sham" and "Eddie Brown's B.S. Chorus." Take a look!HERE. RUSTY TAP DANCES AT THE COMEDY AND MAGIC CLUB! To everyone's surprise, including her own, Rusty became the first tap dancer to perform on stage at the world famous Comedy and Magic Club in Hermosa Beach. She happened to be there with a group of friends, including brilliant magician Brian Gillis and his partner, mentalist, Sisuepahn (see http://www.gillismagic.com/). 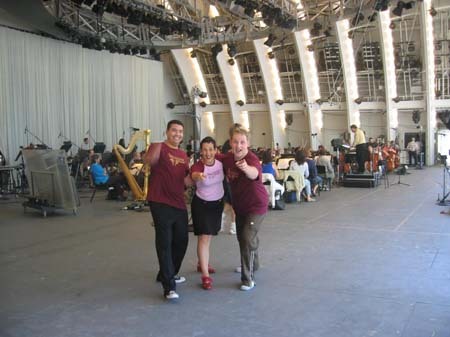 They are friends with the club's owner, and after the first show, approached the management about having Rusty "break in" the new tap dance stage. Voila! She was on in the second set for a brief (and we mean brief -- 1 minute) tap dance routine from 1928. You probably don't remember me but I was thrilled to see you tapping away last night at the C & M club in HB. You were great and it was terrific to see you. WELCOME HIM HOME TOMORROW NITE AT THE RHYTHM CLUB!! There seemed to be a global sigh of relief when the news of Augie's safe return was announced to all Saturday nite. Please join us in celebrating his safe turn at the Rhythm Club tomorrow nite. We plan on having a special "Welcome Home" dance -- LIVE -- with his new pals, The Jive Aces. They have picked out "The White Cliffs of Dover," a very sentimental song for the Brits from WWII about returning home. 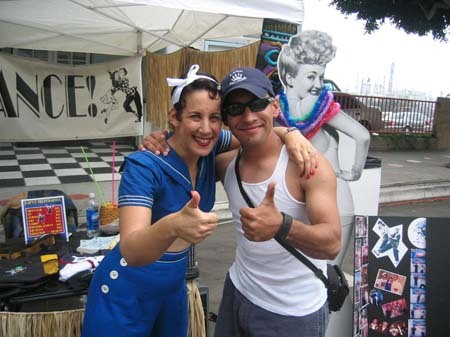 Help make Augie's first dance at The Rhythm Club something he'll remember forever. AUGIE FREEMAN: For those of you who are new to our list, Augie Freeman is a young swing dancer from Lindy By The Sea who is currently serving with the Marines in Fallujah, Iraq. We have basically "adopted" him as our "swing son". Several months ago, we all chipped in and sent over the coolest package to him... but it never arrived. We had cookie, swing t-shirts, baseball caps, cds, books... all sorts of goodies. He was injured while on tour, but is doing great. This particular SSRC Event was planned to encourage participation in our Events by the Association of Little Company of Mary, a lay order of the convent of Little Company of Mary. 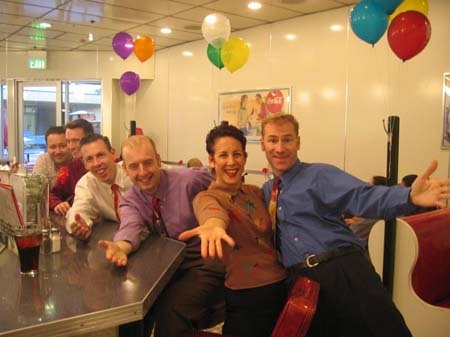 We had some participation from this group at some of our Events in the past and we hoped to entice more Associates into the Swing Dance realm. The most enthusiastic reaction came from the Sisters themselves at this idea. Participants incl. Alice Infelise and Dan Danner, Christian Hansen and Karla (whose last name still escapes me) - demonstrated Lindy and Balboa as well as various dips which drew "ooohs and aaahs" from the audience; Mike and Marisa Klug - the original coordinator of SSRC and his wife attended this Event after a long absence( because of school commitments )- demonstrated Savoy style and balboa; Dolores Valencia and Kirk Tuey - demonstrated Hollywood style as well as West Coast (the state dance of California); Norman Kajikawa was our living sign post, directing volunteers into the correct parking lot as well as helping with the set up and taking down of the sound system; Laura Greenlund was instrumental in the development of the script and music selections (both she and Norman also danced, of course); Don Oyler and Scott Giordano helped demonstrate the various styles mentioned above with the ladies while other leads caught their collective breath after the first half of the program. The second half of the program featured Linda Garcia demonstrating the Electric Slide; this was intended to get the audience on their feet and participating, with the help of the above-mentioned dancers. Not only the Associates but the Sisters also participated, most of whom had danced before and during WWII (I think they had more fun than ANY of us). Yours Truly narrated the script, fumbled with the music selections, and tried to keep the program on schedule (the Sisters have pretty set schedules). A basic Swing Lesson was attempted which was done one-on-one by the volunteers for the Associates and Sisters with the evening continuing 1/2 hour over schedule as all danced. We were then invited to stay for a light supper and beverages presented by the Sisters. Guess we were a hit since no one complained we ran over!!! A VERY successful Event with many good memories for everyone. We have rescheduled this Event for Saturday, November 13, 2004 from 2-3pm. Apparently when we cancelled the 9/25 Event, our Coordinator did not get the message to Norman Kajikawa, who showed up on his own at the Center. When he saw how the patients were waiting for company he decided to stay and arranged to do a little dancing with those who were interested and able. When I spoke to the Center representative on the following tuesday she stated she had forgotten to tell the patients we were rescheduled (which was why they were assembled and ready for the program) and was very grateful to Norman for staying and spending time with them. Artesia Christian Home Event is rescheduled to 13 November, '04 from 2-3pm...depending on everyone's schedule perhaps we could socialize at a local restaurant afterwards...Alice knows some good ones in the area. Since I will be moving I am not sure of computer/internet access in the next few weeks so if you could contact me at work (310-316-2424 attn medical records) or on my cell (310-713-3052) questions or affirmations I would appreciate it. So far, myself and Scott Giordano are attending...would love to get another 4-6 couples, a West Coast or ballroom dance number, someone to carry the equipment, narrate, etc. etc. New photographs up, at last. And more to come. So take a look, and enjoy! 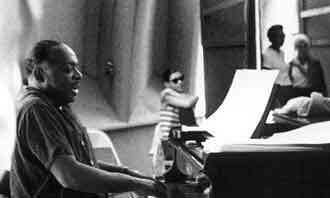 COUNT BASIE PAGE: As it is the centenary of Count Basie, we thought it was timely to have the Count be our link of the week. The page gives you a nice biography of this great artist's life, a comprehensive list of his records, and links to other great performers with whom he was associated. * Wondering what the heck a "gate"is? This was a phrase popularized by 1940's comedian, Jerry Colonna, who would holler it out every time he was introduced on the Bob Hope radio program. It was a friendly salutation to a swing cat (dancer or swing music enthusiast). JOIN THE SWING SHIFT RHYTHM CLUB TODAY! Our Swing Shift Rhythm Club (SSRC) is the volunteer arm of our local swing dance community. 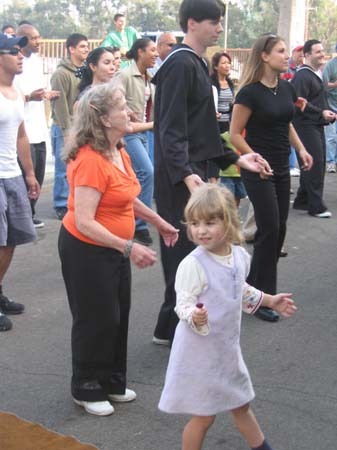 Through the SSRC, we visit senior homes, children hospitals, and entertain and dance at street fairs. 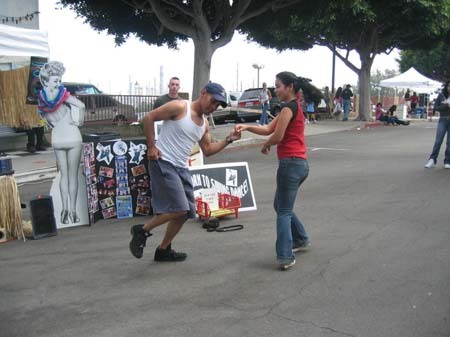 The purpose of the club is to do some good deeds and promote the fun of swing dancing. Anyone can join the club. The events are varied, and purely volunteer in nature. You'll get a notice through the SSRC Yahoo Group website of upcoming events, and you can chose which one(s) you'd like to attend. JOIN NOW! -- click SWING SHIFT RHYTHM CLUB -- send your first and last name and email address.